After a few days of learning and fun I am looking forward to to when I can practice my new found skills. However, this has been put on hold as I have a new project. My son-in-law has recently finished writing his second book and it requires a cover. 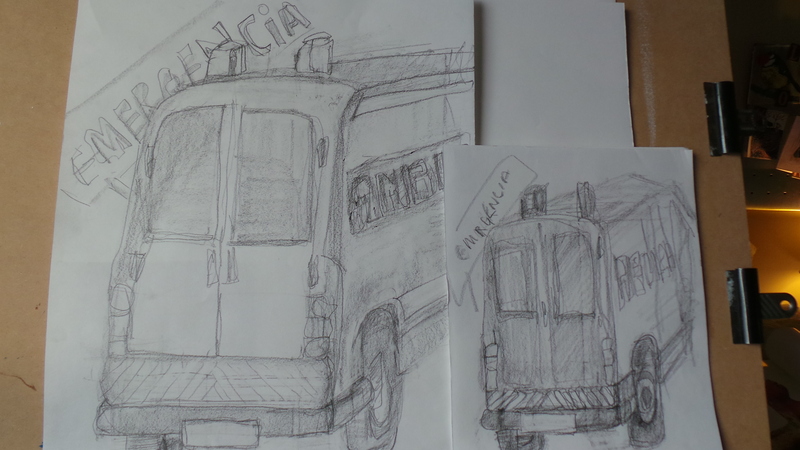 The story is about a hospital; so we thought the entrance at the emergency department might be appropriate. I have made some (many) preliminary sketches but I have come to a halt; when I need to make some decisions. Should I make my image, the finished book size or larger if so how much? For technical reasons these choices make a difference; but I know not what. Then there is the medium , if I were to make it A3 then a Linoprint would not be practical; so I would consider silkscreen print and therefore need help. If I were to do it A4 or smaller, lino would be fine; but then reduction or multi-colour? If time allows then to try all three would be the answer. Um novo livro está nascendo!!! Enfim SUS…em breve!! Hi Helen, Thank you for liking my posts! With regard to the book cover, my first thought would be that the contents and tone of the book may be best reflected in the image on the cover. It might help if the image gives a slight hint to stimulate curiosity as to what happens between the pages.